Mouser Electronics has entered into a distribution agreement with Gumstix.. As part of the agreement, Mouser Electronics becomes an authorized distributor of Gumstix’s comprehensive portfolio of SBCs and embedded boards for the industrial, Internet of Things (IoT), smart home, medical, military and automotive markets. The Gumustix Overo COMs are available from Mouser Electronics in three varieties to provide engineers with design flexibility: the entry-level Overo EarthSTORM COM, graphics-focused Overo IceSTORM COM, and Overo IronSTORM-Y COM (shown) with Bluetooth 4.1 low energy technology and 802.11b/g/n wireless communications with Access Point mode. To enable engineers to test LoRa protocol solutions based on an Overo COM, the Overo Conduit LoRa Gateway includes a Microchip LAN9221 controller for 10/100 Base-T Ethernet capabilities, plus headers to connect to a RisingHF RHF0M301 module and an Overo COM. For engineers using a BeagleBone Black for prototyping, Gumstix offers two capes. The BBB Astro Cape is a capacitive-touchscreen-ready expansion board with Wi-Fi and Bluetooth technologies. The BBB Rover Cape is a “robot-ready” expansion board with 9-axis inertial module, GPS capabilities, wireless connectivity, and pulse-width modulators (PWM) for servo control. 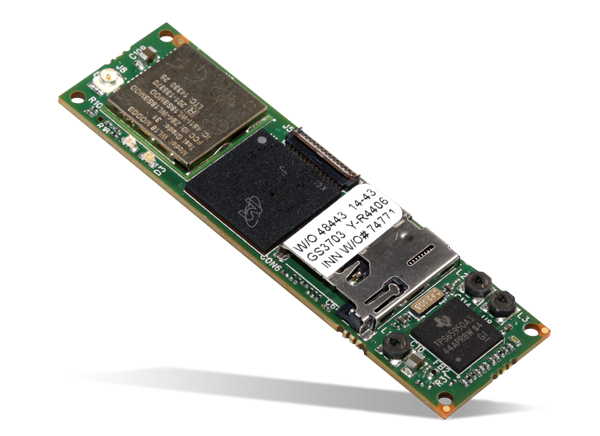 To support Raspberry Pi boards and the Raspberry Pi Compute Module, engineers can take advantage of expansion boards from Gumstix. The Pi Compute FastFlash provides a compact, cost-effective solution that quickly flashes the embedded memory of the Raspberry Pi Compute Module. The Pi Newgate breakout board enables engineers to connect to all of the module’s external signals via 0.1-inch-pitch pins to monitor digital, analog, and differential signals. The Pi Compute Dev Board is a complete multimedia expansion board for portable devices and IoT boards with camera and HDMI capabilities. Mouser is also stocking a series of GPS and camera peripherals for Gumstix devices. The Pre-GO PPP (Precise Point Positioning), with either surface mounted antennae or SMA antenna connectors, provides a high level of global positioning accuracy. The Tiny Caspa parallel camera sensor board delivers reliable video feeds directly to the Overo family of COMs and to many expansion boards and SBCs in the Gumstix line. Additionally, Mouser offers the Gumstix Pepper and more advanced Poblano single board computers. Running on Android or Yocto Project, the Pepper 43C and Pepper 43R boards feature an Arm Cortex-A8 processor, 512 MB of DDR3, 802.11 b/g/n connectivity with AP mode, and Bluetooth 4.1 and Bluetooth low energy. The boards are supported by the Pepper 43 Handheld Development Kits, which come equipped with a 4.3-inch LCD touchscreen, audio in/out, and a Texas Instruments WiLink 8 combo-connectivity module. The Poblano 43C features a powerful TI Sitara AM438 processor, 3D graphics processor, multi-touch capabilities, Wi-Fi, camera connector, and embedded NAND flash storage. The board is supported by the Poblano 43C Handheld Development Kit, which contains a Poblano 43C board, 4.3-inch LCD capacitive touch display, USB cable, 5V power adapter, U.FL antenna, and SD card pre-loaded with Yocto Linux.